I remember the first time I tried hummus. I was at a Mediterranean restaurant called Casablanca, and when I saw it on the menu, I thought, “Why not?” It was served with freshly made pita bread, and the crisp, lemony taste of the hummus paired with the warm pita was one of the best things I had ever tasted. I went home determined to create my own version. I googled hummus ingredients and then went to work in the kitchen. I tinkered around until I found the perfect balance of flavors that reminded me of the restaurant version I’d had. Creamy, lemony, and delicious. Of course, this was back before hummus was in all the grocery stores. When it became popular, I bought some from the store, thinking, this is great! Maybe I won’t have to make it homemade anymore. But then I tasted it…womp, womp. 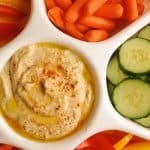 If you think you don’t like hummus, but all you’ve ever had is store-bought, you have to give this recipe a try. 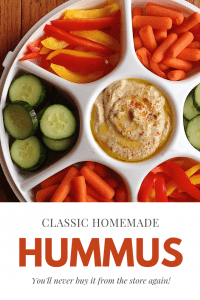 I’m almost embarrassed to tell you how easy it is to make hummus because whenever I serve it, people are always amazed that it’s homemade. Open a can of chickpeas and drain the liquid into a bowl or cup. You’re going to use some of that liquid in a minute. Dump the chickpeas (but not the liquid) into a blender or food processor. Blend on a high setting, adding a tablespoon of the chickpea liquid at a time until you have the consistency you want. You’re looking for creamy but not runny, if that makes sense. And that’s it. I told you it was easy! 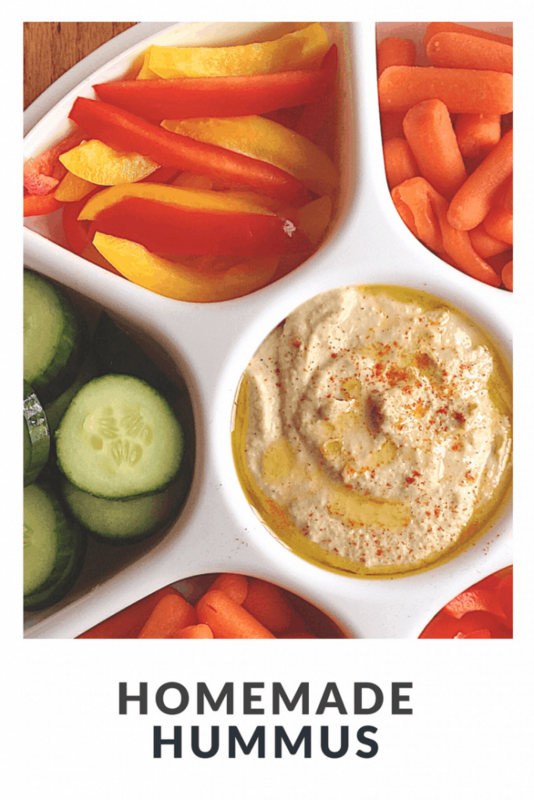 This is a great, simple hummus recipe — I hope you love it as much as I do. Pin it for later! Creamy, lemony, and delicious, this hummus is super easy to make. Combine chickpeas and all remaining ingredients in a blender or food processor. Puree until smooth, adding chickpea liquid one tablespoon at a time until desired consistency. Refrigerate for a couple of hours before serving to allow flavors to blend.